I have always been on the lookout for unique pieces of tobacciana that come from a time in history when pipes and tobacco were not just hobby items but items of a quieter and more reflective life style. I love adding them to my collection. These have included interesting pieces of Bakelite and trench art that were fashioned into objects of use. When I came across the listing for this little silver piece I could not pass it up. It is a little match safe for Swan Vestas that can hang on a key chain for easy access. 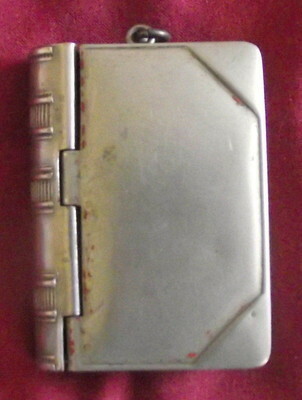 It is a silver book shaped item and loved the look of it when I saw it. It combines two of my hobbies in one – books and tobacciana. The match safe arrived and I examined it carefully. It was shaped like a book. The front and the back cover were originally painted with a red paint and remnants of that remained on the centre portion inside the corners. On the spine of the book the smooth portions also show remnants of red paint. The notched spine and the page area of the book were striker areas on the book. The book itself measures 1 7/8 inches tall by 1 3/8 inches wide. The closed book is ½ inches thick. The front and back covers are spring loaded. 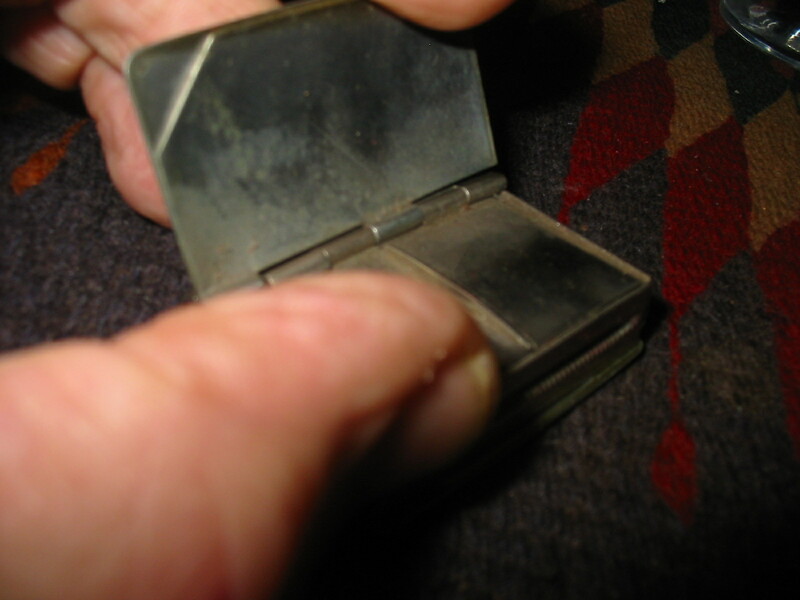 The front cover when opened contains the area to store the matches. 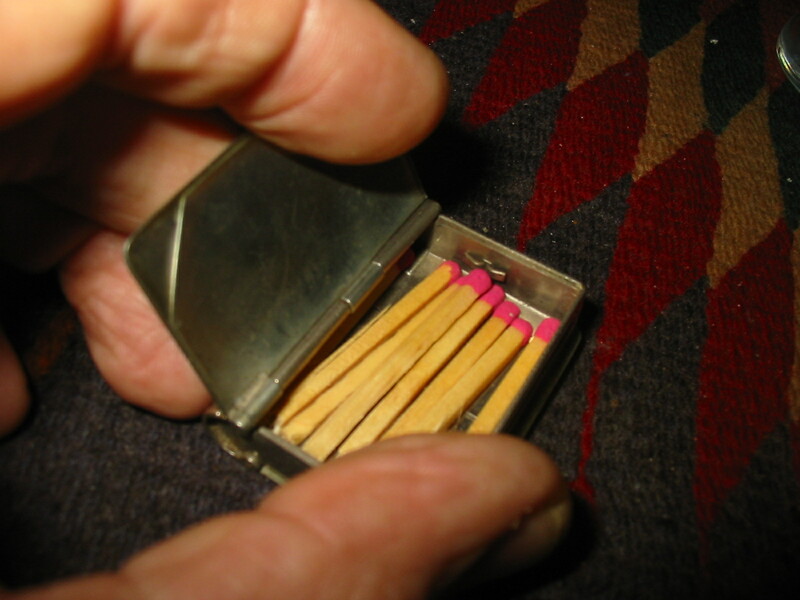 I filled it with some wooden matches to enable you to have an idea of what it looked like. The back cover when opened contains two spots for stamps to be stored. 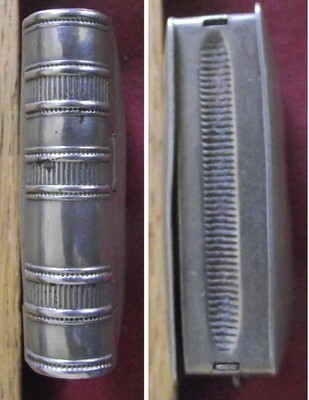 I have polished the match safe with silver polish and cleaned up the dust and buildup from the years. It is now on display with my other tobacciana in my pipe cabinet. It fits nicely with other pieces of pipe and tobacco history that reside there. Do you collect pipe and tobacco pieces besides your pipes? How about posting a response about your collection here? This entry was posted in Pipe Related Essays and tagged match safe, Pipe related essays, silver match safe, Swan Vesta match safe, tobacciana and pipe and tobacco history on September 22, 2013 by rebornpipes.